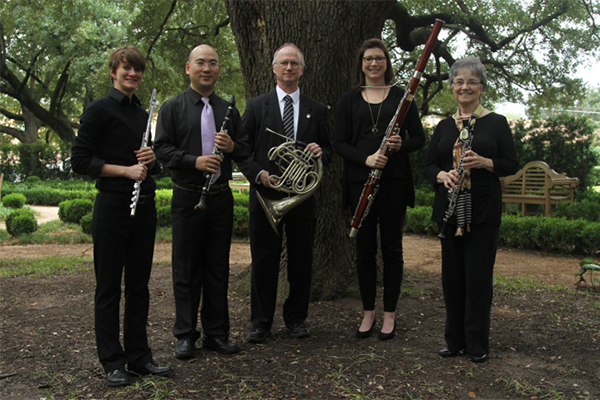 The Baylor Woodwind Quintet, founded in 1972, is composed of resident faculty members of the Baylor University School of Music in Waco, TX. For many years the quintet was the nucleus of the Baylor Chamber Players (a flexible group consisting of duos through larger ensembles that also included percussion and saxophone). The Woodwind Quintet was awarded three grants from 1979-1983 to study chamber music in Vermont with the renowned Paris Conservatory flutist and chamber music coach, the late Marcel Moyse. In 1984 the National Flute Association selected the quintet to premier their commissioned piece, Richard Rodney Bennett's Concerto for Wind Quintet, at the annual convention in Chicago. The quintet has also been invited to perform recitals at the NFA conventions in Kansas City in 1994 and in Phoenix in 1998. Including both the Woodwind Quintet and Chamber Players, the members have performed at state, national and international concerts, conventions and recitals in the United States, Canada, Mexico, various European countries, China, Central and South America. The members can be heard on PBS Radio, Composers' Recordings, Crest and other recording labels. The ensemble has received numerous grants, commissions and dedications for works of various instrumentation by composers such as Verne Reynolds, Merrill Ellis, Frank Campo, Burton Beerman, Richard Willis, William Kraft, Brandt Adams, Charles Rochester Young, Paul Richards and most recently, Scott McAllister. Pulitzer Prize winning composer, Steven Stucky is composing a new work for the Baylor Woodwind Quintet with percussion in memory of the late Larry Vanlandingham, former percussion professor at Baylor. The quintet will soon be releasing a CD of works by a select group of composers closely associated with Baylor University.